The traditional production method of Dextran involves bacterial fermentation and alcohol precipitation, which is low in efficiency and costly. Herbon International’s proprietary enzymatic synthesis technology can synthesize the required molecular weight Dextran products. This technology effectively avoids the bacterial pollution caused by the traditional bacterial fermentation method, and simplify the production process. No organic solvents are used during the process. We use a nano filtration purification system to remove impurities, which guarantees high-purity products, ensuring our product quality achieves international standards, also provide high-quality substrate raw materials for our derivative products. 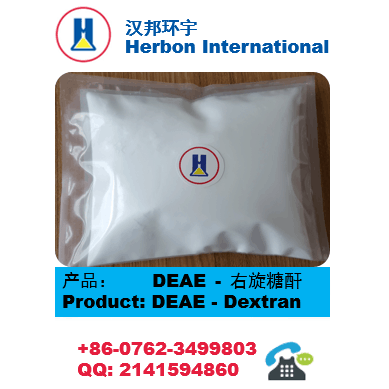 Based on our competitive advantage in Dextran products, we can tailormake DEAE Dextran according to client’s needs, including molecular weight and other quality requirements.